How many times can you remodel a room? Well, we’ve remodeled our kitchen twice. Once as an inexpensive “tie us over” until we have money remodel, and one serious reconfiguration and total renovation when said money was available. Our children’s rooms were given touch ups and treatments several times over the years, and now since we are empty nesters, they have become our grandson’s room and the “exercise room”. So they have been overhauled more permanently. The bathroom the kids shared while growing up in our home experienced a makeover in which we pretty much let them choose the colors and type of flooring. We added wainscot to the walls for durability and aesthetics and it came out quite nicely and has lasted for about 6 years until our youngest started his second year of college. This remodel was filled with experiments. Our first attempt at laying a decent laminate flooring, adding wainscoting, tearing those dreaded wall strips out and covering with paintable, blemish-reducing wallpaper, adding a real light fixture over the sink that was a bit heavier than cheapo manufactured housing walls can endure. Not everything went as smoothly as we would have liked, but we think this project went pretty well and the kids seemed to like it. The hardest part for me was letting go of color choice since they all agreed on STOP SIGN RED. Yep, that’s right. You read that correctly. This, in a home with neutral earth tones and lots of white. Hmmm, how would I ever get them to change their minds?! Well, I decided not to change them at all, and, in the end, it was pretty lovely and very masculine for a bathroom shared by the three males in the house. Since doing this room, we have used paintable wallpaper in another room, removing the strips prior to hanging the paper. We used DAP Fast and Final Lightweight Spackle to spread in the seams between the wallboard pieces. It indicates no sanding is necessary, but you may want to spread it as smoothly as possible, making sure to really fill the seams full and smooth at the edges, then perhaps sanding the edges of the smear of spackle with a very fine grit sand block to keep the look of seams under the wallpaper at a minimum. This will not be perfect, but the more patience you use while filling and smoothing the spackle, the better results you will have in the long run. We used an inexpensive vanity and one of the less expensive brands of laminate flooring, but it took less than 3 boxes of flooring to complete the whole room (9’x7′). We use wainscot that is quick install and available at the Home Depot. We’ve recently seen a comparable product at Lowes, but it seems to be a bit more expensive. You can do a room this size for less than $100. You can purchase either Cape Cod MDF Wainscot Planks or the vinyl product that is similar. You can install this stuff in less than an hour with Loctite Clear Power Grab Heavy Duty Construction Adhesive. It’s easy-peasy. We have the MDF version all through our house and it is every bit as durable as the vinyl in our estimation. It comes primed and just requires a quick coat of paint. The difference we have found is that the vinyl product doesn’t need to be painted, but is twice the cost. You can purchase packs of corresponding bottom and chair rail in 8′ lengths for about the same price as two of the wainscot packs. If you choose to use wainscot on your walls, be sure to measure your sink vanity and allow for any back splash that’s on it. You won’t want the back splash to sit against the chair rail. If the vanity is in the way of where the chair rail should be, you may want to discontinue the rail until the other side of the vanity and continue it after that space. We did not upgrade the tub in this remodel. Remember, it was done to get us through raising the boys and having a better bathroom for them that was acceptable for company to see! The tub was fine for our purposes and only had minimal scratches. The sink fixtures we used were brushed nickel. Now, I don’t know how to recommend sink fixtures for a bathroom. So much water sits on them in a bathroom, especially with kids, spitting their toothpaste all over the place, splashing water and never wiping up after themselves. If you have hard water, any kind of fixture you get is going to have lime deposits and water spots on it in no time. I own a cleaning business and clean our fixtures weekly. This is no matter…after only a couple of years, there were visible collections of water damage on these fixtures. Our shower fixture was the cheesy chrome style and even that was easily rusted and water stained. 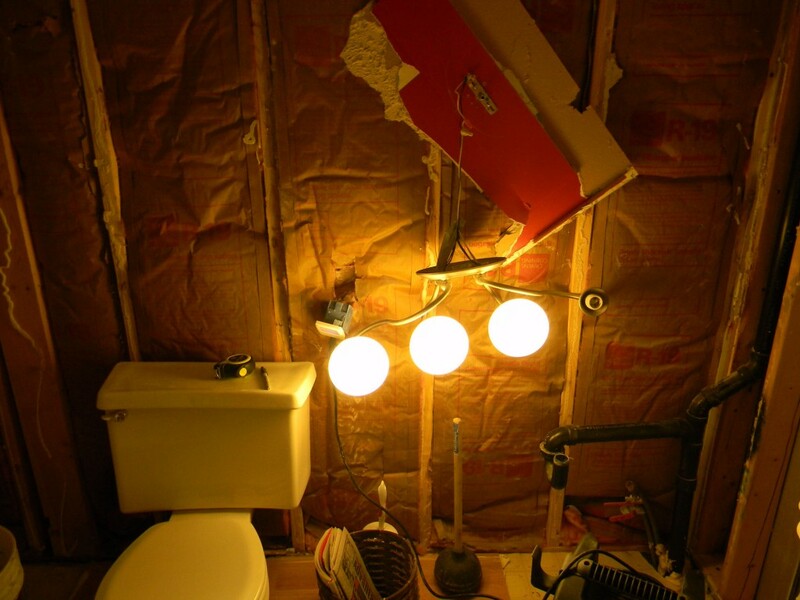 If you are lucky enough to have softer water, you shouldn’t have as much trouble with your fixtures. The light fixture was a royal pain. Our walls were the normal cheap gypsum board that doesn’t hold a picture frame, let alone a 5 lb light fixture! We ended up cutting a 3/4″ thick piece of wood about a foot long and drilled a hole in the center to feed the wiring through, then mounted it to a stud in the wall. 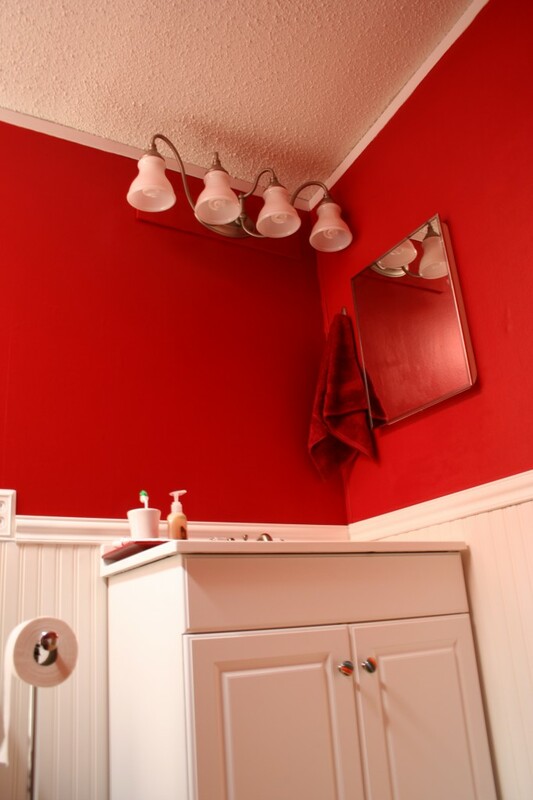 Once installed, we painted it the same red as the wall and it served as a mount for the light fixture in order to center it in the place we wanted it over the vanity. The medicine cabinet needed to be replaced, and, since the kids would be using the bathroom, we just replaced it with a similar, inexpensive cabinet that cost less than $20. It fit snuggly in the same space the old one came out of and looked fine. An inexpensive white framed mirror was centered over the sink eventually to finish off the space. Another treatment we included was a nice row of towel hooks that matched the room. 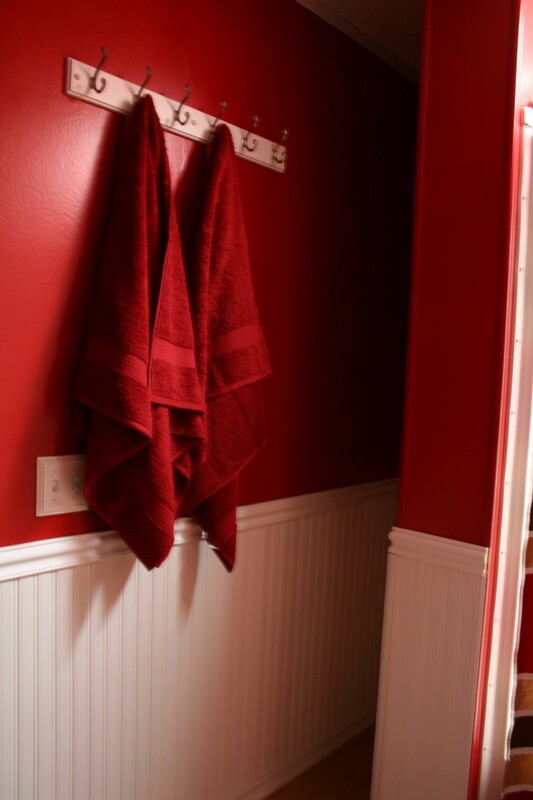 This gave the boys a place to hang towels and gym clothes, belts, etc… A nice, masculine shower curtain from Target and a set of red towels finished off the room nicely. The one thing we just never solved well was a hand towel hook. Because of how thin the wall board is, hanging a hook for boys to grab a towel from each time they used the sink just wasn’t a good idea. It would be hanging out of the wall in no time. We tried the 3M brushed nickel wall hooks with the removable sticky strip on the back. I have to say, we have tried these in several different applications and they are useless. Sorry to give such a bad review on your product, 3M! But, they don’t stick for longer than a day and certainly not when they are expected to support something that’s hung on them. Very disappointed. Anyway, I eventually learned to love the red. The kids loved the look…it sort of had a barber shop style to it. And it lasted for quite a few years. But interestingly, in our house, things rarely stay the same for very long. We’re very fickle folks and regularly switch things up. While we were really happy with this bathroom remodel that cost less than $1000 and added a real “pop” to our home, once we became “empty-nesters”, we decided it was time to change things in this room once again. It’s time for a grown up look. Alas, the fun never ends! Stay tuned for a look at the most recent renovation of this bathroom. I promise, we’re done this time :-)! Happy renovating in the New Year! Wow, the red may be bright, but I like that it's balanced out with white. I think it's pretty impressive that you remodeled the entire bathroom with less than a $1000. Go you. Have you checked out this blog post on Popular Mechanics. 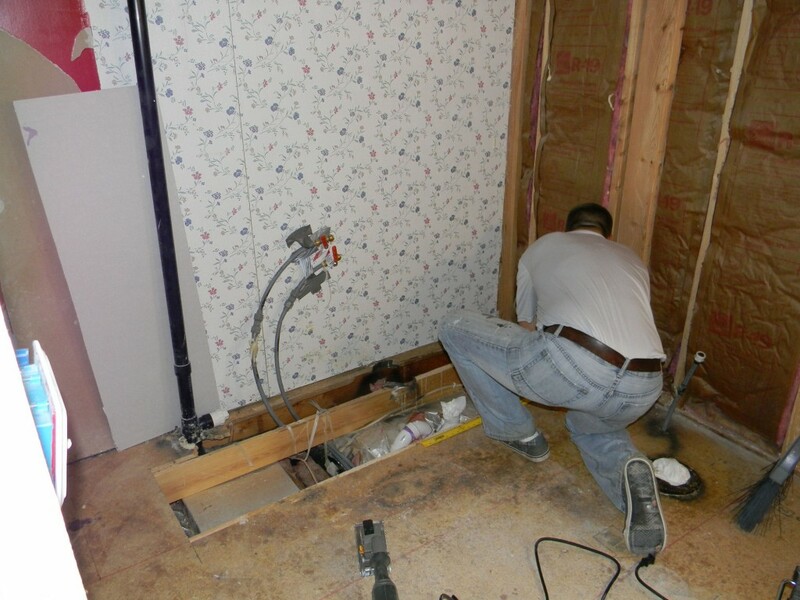 It tells you little ways to avoid paying for a plumber, which is good if you want to have extra remodeling cash. Good luck with your future remodeling and keep us posted. Thanks, Justin. I was leery about the red, but I decided I would be hands off and let our teenage sons pick everything. It was scary painting all that red, but it really did come out nicely! Sometimes, it is important to hire someone. You don't want to have leaking water in your mobile home. 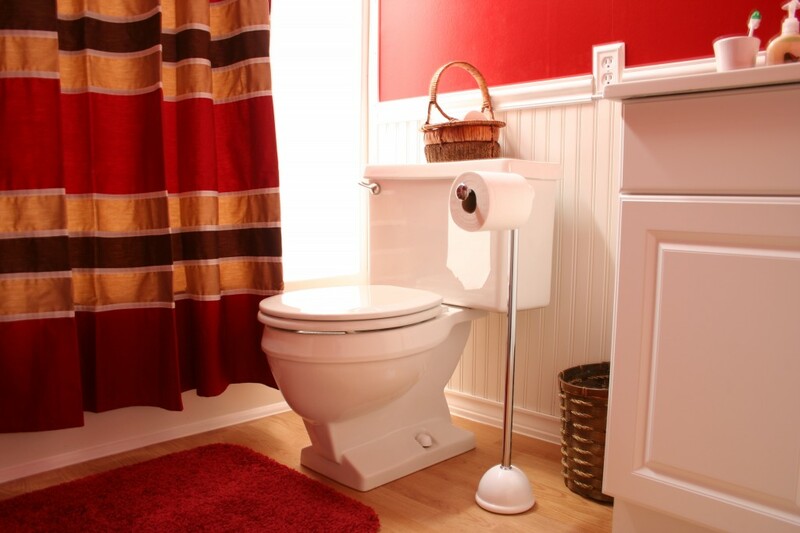 If you really don't feel confident and don't know what you're doing…don't chance it and don't skimp on plumbing. We’ve started remodeling our boys bathroom and just replaced the tub and flooring. I would love to do the paintable wallpaper and wainscoting. I found the wainscoting at Home Depot but am having a hard time finding the wallpaper. Do you know where to look? And did you do any prep work to the existing mobile home walls before you put the wallpaper up (besides removing and spackling the strips)? Thank you for your help!! Hi Robin. Thanks for visiting and commenting! While Lowes and Home Depot really don't have wallpaper sections to speak of in store any longer, they do sell it online. If you go to Lowes.com or Homedepot.com and search their sites for "paintable wallpaper" you will get a bunch of results with different textures and designs. They are not that expensive and they most often come prepasted so they are easy to hang. We didn't do any prep other than what you mentioned and it came out great. I am considering re-painting that room with a flatter paint though. I think if you choose a textured paper it will look more like plaster if you use a flatter paint. So, I'm going to give it a whirl I think. I also believe they told me at Lowes last time I bought paint there that there is a new sheen in between flat and satin that is like a washable flat. I could be dreaming that! But, I'm pretty sure I was surprised there was a new sheen. If it wasn't there, it was at Home Depot. Good luck with your project. I love the paintable wallpaper. It was really easy. I do like the random plaster look texture that we used, but I think if I were to do it again, I would use one with geometric shapes or a damask look. I think it would be more elegant. I really like the colors you chose and the light fixture. That is the type fixture I installed because the original fixtures did not focus the light down where you would want it. I hate not being able to in a bathroom. You did a great job! Thanks, Jack. Those lights lasted for a long time. I actually put one just like it in another bathroom remodel because we liked them so much. 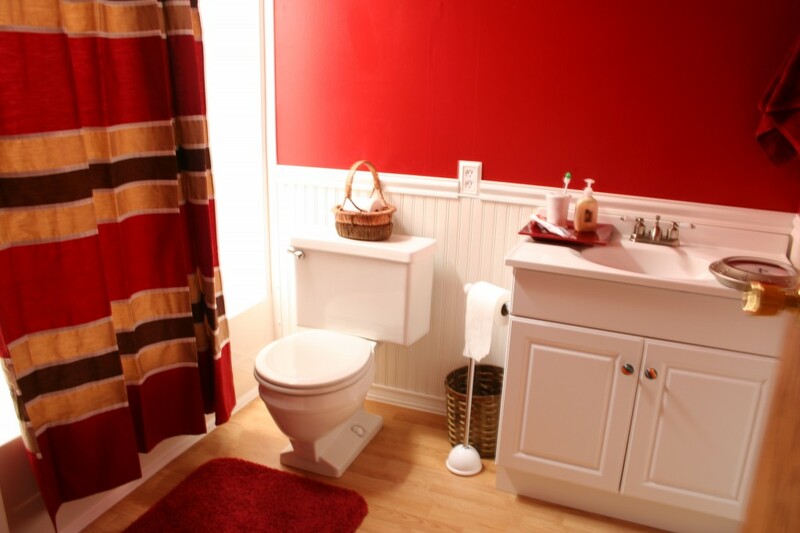 Well, this looks to be a very beautiful combination of both red and white in a bathroom. Thank you so much for taking the time to comment on our site. You have A LOT of energy to take on this project. I have always been afraid to do the moisten and pull down approach to this. I have been afraid that it would also ruin the "sheet rock" under the spray popcorn. I'm glad to hear that it doesn't do that. It sounds like a huge mess! We have used a shop vac with a hard floor attachment on it to scrape the popcorn fairly smooth and then our plan is to then mud over that and make a design in it. I would love to see pics of your finished project! If you think of it, please do visit our facebook page at https://www.facebook.com/mobilehomemakeover and share some pics! Thanks again for your comments and for sharing your success! we have remodeled our dbl wide all except the ceilings—which have popcorn and brown ugly strips. Any ideas? 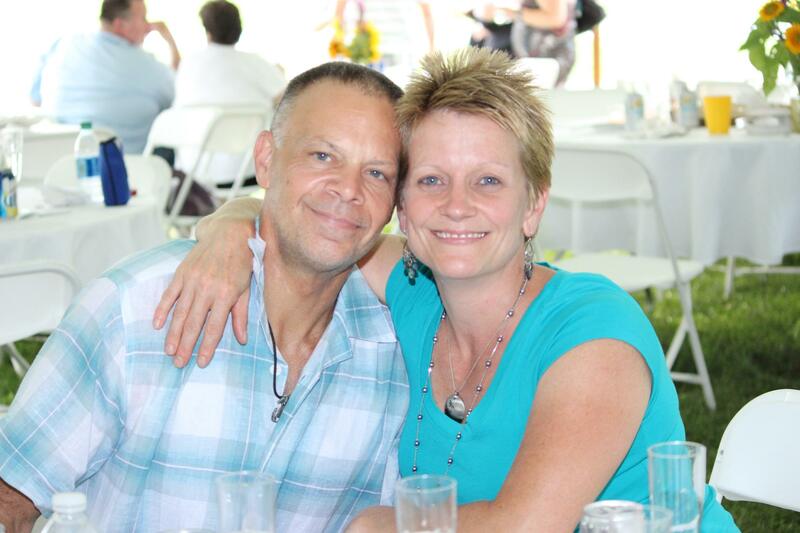 Oh Vicki….you ask one of the most common questions and pet peeves about double wides! 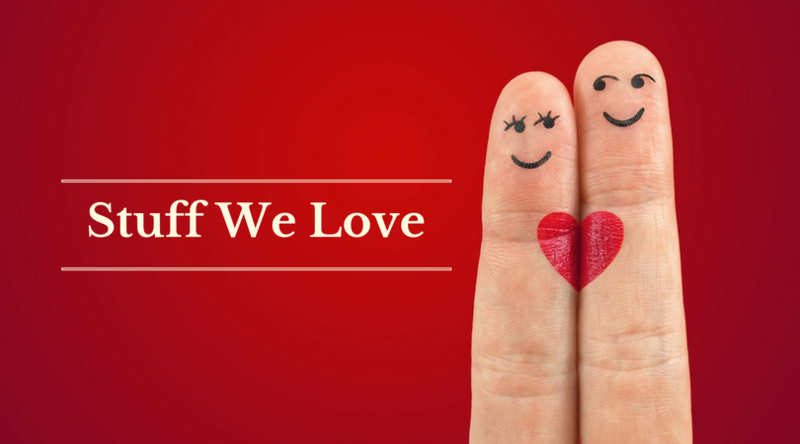 Thank you for visiting our site and commenting. We have scraped the popcorn off of most of the ceilings in our home. I use a large shop-vac and I stick a kenmore vacuum hard floor attachment on it and scrape it so it's smoother. In two rooms, we have not gotten around to doing anything but I think we are going to do a dove grey and white cloudy sponge look in flat paint. But you should know, once you paint popcorn, it is sealed for good unless you take it down. We didn't want to take it down because it provides insulation in our ceiling and there isn't much of that otherwise. It came out beautifully and I wish I had the energy to do it in every room! I've seen some videos on youtube of people spraying it down so it's wet and then scraping it down. But we never wanted to remove it completely, just make it smooth so we could apply something over top of it. If you find a good solution…PLEASE PLEASE PLEASE come back and share it with us all. We are always getting asked this and would love to have some more solutions to share with folks. Thanks again for visiting and good luck with your projects! Hi. My grandmother purchased a new mobile home in 2005, 16×80 I believe. Now that she's in her late eighties, we have added quite a few safety devices like handrails to help in the bathroom but she really needs a walk-in shower. The bathroom she uses has a tub and the "shower stall" in the other bathroom is raised higher off the floor than the tub. My husband and I can do the installation but we don't know if we can install a standard shower pan thats only 3"-4" tall in a mobile home. I assume the tubs in mobile homes are the way they are because plumbing comes up above the floor? Can we change that? My basic question is can we purchase a standard shower pan and surround panels from a home improvement store and make them work? Installing anything taller doesn't accomplish the goal we want for my grandmother's safety and comfort. I appreciate any help you can provide. 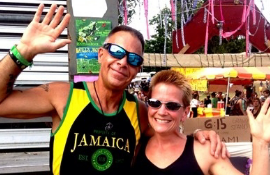 Hi Jeri. Thanks so much for commenting! We did install a shower pan. I believe it was 42" Because the original bathtub was 54", we had to take the small backing wall down and put a new one up in order to support the new width of the shower. This wasn't difficult. 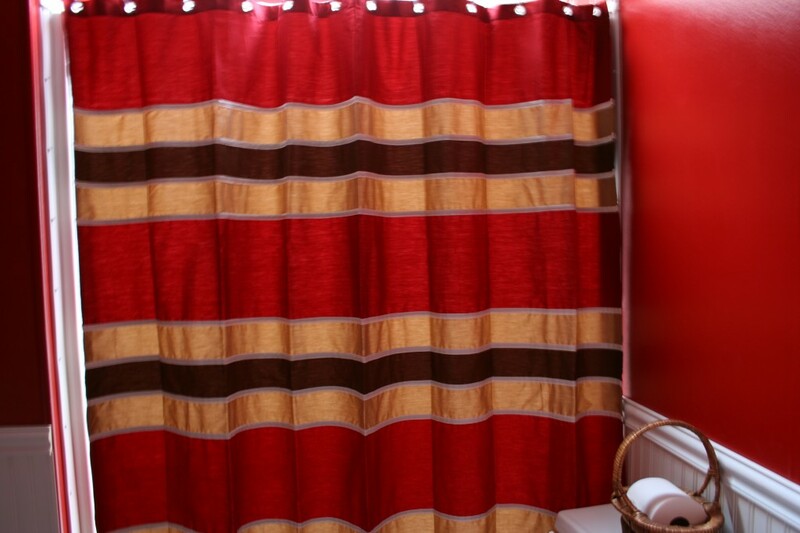 If you have a wall like this that serves to close in the tub, it is made of really cheap materials generally and should be really easy to take down and rebuild. If she can find a shower pan at one of the big box home improvement stores that is the right size without making any structural adjustments, that's even better. They make all types of sizes now and newer mobile homes have more standard sizes than they used to. If you can't find what you want online, be sure to go in and speak to someone in that department at either Home Depot or Lowes. They are often able to order even odder sizes than they have on the floor. Check out our newest post to see the one we installed and thanks again for commenting! So, as you could probably imagine, it was a pretty radical contrast. The newest bathroom- version 2013- is completely different. I'll post about it soon! 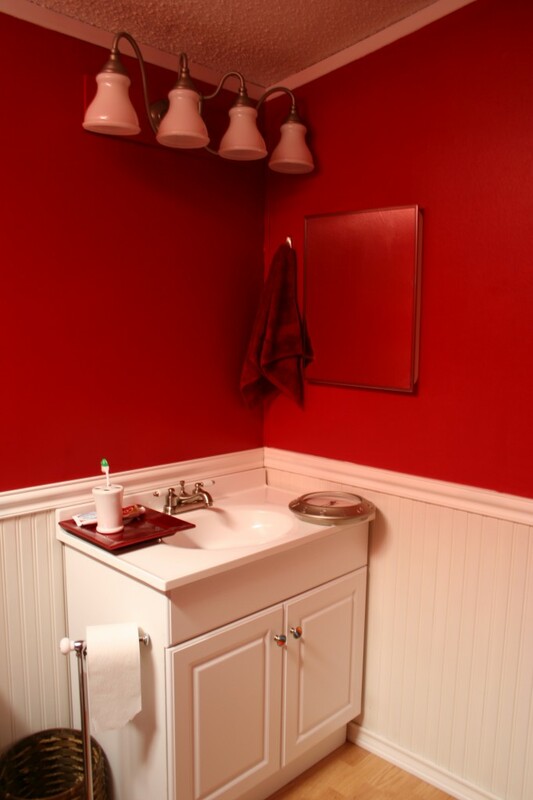 I like the red bathroom, sorry to see it go, but cannot wait to see your next design!! I have only painted a few rooms in my MH, but we plan on some serious remodeling this year to change the look of ours.